One of the most important bike parts on your trial bikes is drivetrain - cranks, chain, cog, freewheel, chan tensioner, bottom bracket and other small parts. We offer ISIS bottom brackets, or BB30 / AS30 bottom bracket or ISIS cranks. Aluminium or steel cogs with many engagement points. There is many options to choose the right trials part for you. KMC je proslusým výrobcem řetězů pro celou škálu cyklistických sportů a nejnom pro ně. Jejich řetězy patří mezi nejlepší na světě a díky svému širokému spektru působnosti si vybere naprosto každý. 1mm podložka z oceli, která pomůže oddálit volnoběžku na závitu od kliky / příruby náboje. Podložka pasuje také pod pastorek. Díky podložce je možné upravit příliš vysoké křížení řetězu. 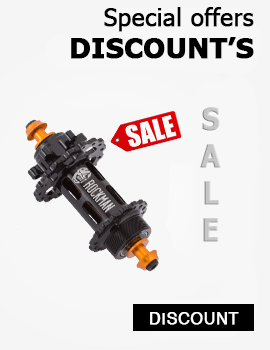 ROCKMAN BIKES freewheel with 135 engagement points! Extremly fast response from the pedal! This amazing amount of engagement points deliver big noise with every spin of your cranks! Fitted with extra strong springs, providing more positive engagement, a louder sound and reducing bedding in time. Splined trials freewheel CREWKERZ with amazing ration of engagement poinst! 135 engagement points in total offer very accurate rotation of your cranks and very positive feedback in pedals during rotation! 18 teeths is standard for 20" and also 26" trials bikes.